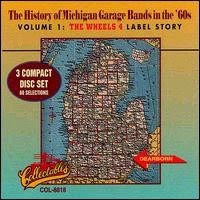 60 tracks over 3 discs, this compilation features many lesser known Michigan garage acts who released material through The Wheels 4 label out of Detroit/Dearborn in the 1960s. An incredibly interesting and mildly depressing collection of songs for anyone from the Metro Detroit area. Although the Detroit music scene is obviously still going strong, the sheer number of garage pop acts is a reminder of how vibrant of a city Detroit once was. And no, there isn't a volume 2. To be fair, it's not bad over here musically, at the moment. i know, i just moved out of michigan last year. lived there my whole life, and we've posted plenty of awesome new detroit bands. key word was "vibrant" in that statement.